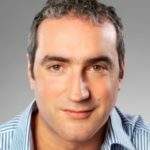 Paul Zakkour is a director of the consultancy Carbon Counts and a visiting researcher at KAPSARC. Paul has more than 17 years’ experience in the field of climate change policy, regulation and economics. Among other work, Paul advised on the design of European CCS regulations in 2007/08 and on the UNFCCC’s CCS rules under the clean development mechanism in 2010/11. Paul holds a Ph.D. in Environmental Technology from Imperial College, London. The Paris Agreement committed ratifying Parties to hold the increase in the global average temperature to much less than 2°C above pre-industrial levels and to pursue efforts to limit the increase to 1.5°C. The Agreement also committed Parties to achieving net-zero emissions in the second half of this century. Technologies involving carbon capture and storage (CCS) are seen as a critical part of a portfolio of low-carbon technologies capable of delivering deep cuts in anthropogenic greenhouse gas emissions, in line with the Paris Agreement goals. 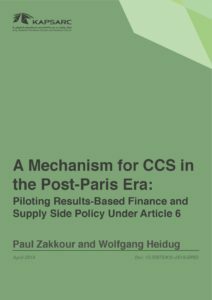 This paper proposes a new, transformative, incentive mechanism for CCS, forged by a ‘club’ of Parties to the Paris Agreement with a common interest: the pursuit of cleaner fossil fuels. A new CCS-specific technology mechanism is suggested as a means by which to unify the club’s actions, built upon a new tradable asset class specific to CCS: a carbon storage unit (CSU). A CSU would represent a verified tonne of carbon securely stored or sequestered in a geological reservoir i.e., a verified record of carbon stock addition to the geosphere, but with no intrinsic emission reduction or removal value. The authors argue that their proposed storage crediting scheme can complement and supplement carbon pricing, unlock new layers of climate finance for CCS, and overcome barriers historically faced by the technology.